Happy Mother’s Day to those of you who are celebrating! It is a beautiful day here in the Midwest: sunny with a high in the 80s. The perfect day to celebrate life. I have been in hibernation these past three weeks. Quite honestly, I am just trying to survive the next few days until school ends on May 20, Mandy graduates on the 22nd, and her Open House concludes on the 26th. At that point I plan to begin to focus on me. I am on automatic pilot at school – and I am comatose when I return home. I have not even had the energy to read blogs – one of my favorite past times – but I am hopeful that routine will recommence in June. I have found a new website, however, that has allowed to me voice my concerns, frustrations, etc. without boring my blog readers with all those details. I have learned over these past two years that I need to write – that I need to get all the thoughts down on paper in order to make sense of life. Otherwise, I just ruminate on the same issues over and over again – treating my thoughts like a worry stone and wearing my mental state thin. In her book, The Artist’s Way, Julia Cameron talks about the value of “morning pages” for the creative artist in all of us. 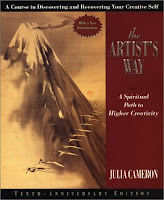 Cameron teaches that dumping our thoughts on the page first thing in the morning – 3 pages worth of dumping – will eventually clear the mind and make room for creative inspiration to take a foothold, rather than being strangled by the concerns of life. I have tried this method of journaling several times over the past couple of years, but I never last more than two or three days. Writing in long hand takes time, and in order to try to do it before the day begins, I either must get up far earlier than I desire (to the tune of 4:30AM) or I write so fast that the words are indecipherable and my fingers have cramped. But two weeks ago I discovered a site, 750 Words, that is an online community for morning pages. The average number of words on a double spaced, type written page is 250 words — and the rational is that if you wish to write 3 pages each morning, you will need to write approximately 750 words. Clever, huh? I have been faithful to write every day for the past fifteen days. The site will send a reminder email, if I so desire, and there is an automatic word counter that lets me know how many words I have left to type – and when I have achieved the goal. There are even badges that reward consistent behavior – perfect for the goal oriented writer such as myself. Like most people, I type much faster than I can write by hand – so my writing tends to stay on track with my thoughts – and I find that I finish these morning pages in an average of 15 minutes. A very doable routine that does not require me to set my alarm earlier than usual. Anyway, that is how I have maintained my writing practice – even though it has not been visible here. I have lots of plans this summer – which include developing new daily routines that help me to experience ALL of life rather than focusing on just one aspect which causes tunnel vision and resentment. I want to maintain a more balanced lifestyle and I anticipate my blog will reflect this. I will definitely begin to read fiction again – and write book reviews. But I also plan to cultivate my creativity with quilting, scrapbooking, photography, and writing — and will blog about that as well. Teaching will continue to be a focus September through May, and I will occasionally update with antics from the classroom. I hope to reconnect with many of you, online friends, in the very near future. In the meantime, I must now prepare for Brynn’s dedication service at church this morning – and then the three generations will go out for a celebratory brunch. I hope that this day is as special for you! First of all, what an adorable baby! It would be hard not to constantly thank the heavens for such a gift! I've been thinking about you, and hoping you were OK. You have had so much going on in your life, and whether it is positive or negative chaos, it takes its toll. This is YOUR summer Molly. I miss you, and look forward to hearing about all your adventures! Back when I was trying to become a novelist, the most productive thing I ever did was to set my alarm clock ninety minute early, get up and spend that extra time writing before I went to work each day. I think making the task a kind of job, with a dedicated set of work hours really helped me. But, whatever works for you is the thing that works for you. Happy Mother's Day to you too Molly! Molly!! It's so good to hear from you.. you've been in my thoughts these past few weeks. Your new grand-daughter is beautiful. Enjoy your brunch celebration! The school year will be over before you know it. I just know this will be an important summer for you. Happy Mother's Day. I'm sure this was a bittersweet Mother's Day for you. I can't believe how big Brynn looks already! Thanks for mentioning that site for the morning pages, Molly. I like the idea of those, but I write a lot better on the computer, so it's good to know there's a place for it online. And hang in there – school will be over soon! Happy Mother's Day to a beautiful woman and Brynn is just precious!!! That website sounds great…I've been mulling over a few things to write and will be checking it out. Keep the 20th in sight..you're almost there! Ah yes, we have to keep our eye on the prize – – for us in the educational world, it is the last day of school, graduation, finals, report cards. It's just hard to keep that same focus in our daily lives; those things without immediate deadlines. Things like reading, meditating, praying, writing sometimes suffer when we don't have that same focus of a timeline. I'm glad that you were able to find something that will help you accomplish the same writing but in an easier format. You've been through a blender of emotions recently. I hope that you can find peace through writing and focusing on things bigger than yourself. Happy Mothers Day, Molly! And that is a fabulous link…. Thanks for posting it! Brynn is beautiful!! HOpe the weekend was everything wonderful. Brynn is so so cute … and smiling already!! How wonderful. And I'm glad you found an outlet for yourself that works. I find that typing is easier than writing long-hand too. I know this was a difficult Mother's Day for you, and with the added stress of impending graduation and all that entails, I can see why you've been hibernating. You have my continued prayers and I look forward to hearing more about your writing and your summer. Maybe we can even find time to meet in KC at some point. Take care. Your grandbaby is precious to look at and I'm sure even better in person. Glad to hear you are making some progress coming out of the fog of the past months. Keep going one day at a time. Byrnn looks like she's cheering for her dedication ceremony! She's a real sweetie. I'm sure this was a hard Mother's Day for you; having Brynn to focus on made it a bit easier, I imagine.